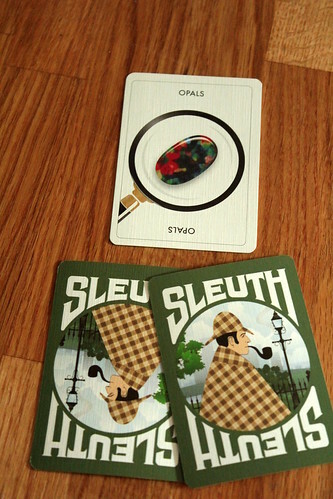 The goal of the players in Sleuth is to find out which gem is missing from a set of 36 different possibilities. In order to do so players need to obtain as much information as they can about which gems are NOT the missing one. In order: each player gets a sheet to note and process all information gained during the game; a pen/pencil comes handy as well. Then, the gem deck consisting of the 36 gem cards is shuffled. First one card is set aside (you guessed it: that is the missing one!) without being revealed to anyone. Then each of the private eyes in the room is dealt an identical number of cards (ranging from 11 in 3 players to 5 in 7 players), remaining cards (if any) are revealed to all players. Not much of a detective, are you? One element cards allow you to enquire about one property only, for instance the number of all BLUE cards one player holds. The questioned player announces the number to everybody but does not give any details which specific cards he has. 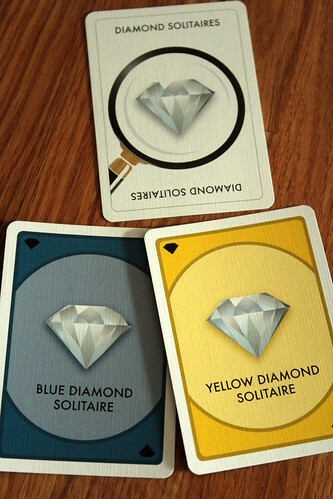 Two element cards allow a more detailed questioning, namely about two properties: you might ask another player about the number of red opal cards they hold, or blue solitaires or diamond pairs. Again the total is announced publicly, but in this case the enquiring person has an advantage as they also get to see the corresponding cards and learn which ones exactly they are. Thirdly there are also wild cards, or free choice cards which are underdefined and allow different questions with the same card. ‘Free choice pairs’, for example, allows to ask for pairs in a certain color or pairs of a certain jewel type. These can also be used as one element cards, although this is rarely done. When using them in lieu of a two element card, you get to know the specific cards again. The players now take turns asking information from other players and listening to information elicited by others, marking their findings on their sheets, trying to complete the puzzle or rather finding the hole in the grid which was left by the missing gem. Once a player is close to solving the puzzle they have two options. If they are close but not sure yet, they may ask one final question to one player without the appropriate search card, but HAVE to announce their pick afterwards. Alternatively, if a player is certain at any point they may, after any turn has been completed, solve the case out of turn order. To resolve their pick the player indicates their guess on their sheet and checks in secret with the cards set aside initially. If the guess is correct, the player reveals card and sheet to prove their correct pick. If the pick was wrong, the detective announces their failure, returns the card in privacy and is relegated to a passive role for the rest of the game. This means that the player may not ask questions anymore, but still has to answer other investigators’ questions. So in theory all players could fail, but realistically if all but one players have guessed wrong the remaining one will be well-advised to double confirm any pick they are about to make, so they should usually take the victory. It should be quite obvious that Sleuth is not a game of creativity or extensive, elaborate strategies, but obviously there is quite some advantage in planning what to ask whom based on your own cards and information gathered along the way. Also it should come as no surprise that different notation techniques will prove to be a factor in keeping track of questions and answers and allow deductions from hints and incomplete clues. But the game is far from a dry, brainiac affair, and it is way more fun than one might think trying to keep track of what is going on and finding the best next step based on the search cards at your disposal. Add the fact that even outside of your own turn you will always be busy processing data and given a game duration of 30-45 minutes there is hardly any time to get bored or distracted by downtime. Luck is a factor through the search cards you draw as well as the way questions and answers combine, allowing you to deduct certain things. As well, and obviously, the fewer questions are addressed to you and the more are put to others, the better for your information level; but in general the game is very well balanced and will not favor any one player. 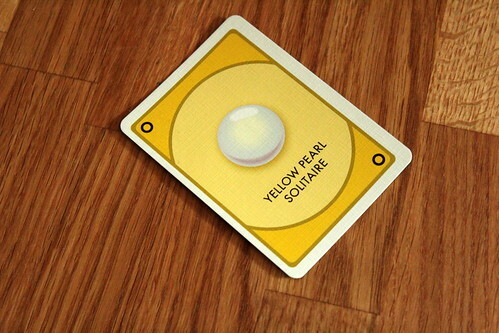 The design of the cards is not fancy but functional, as you would expect, and so are the other materials. Thanks to the straightforward rules the game is very easy to play with newcomers and less game-affine people. Thanks to several variations which usually make things tougher, the game also allows new twists and prolonged playing fun for experienced players.